With the death of his mother, nerdy third-year middle school student Taro Hanaukyo traveled to Tokyo to meet his grandfather. What Taro found there was a huge estate so immense he couldn't see from one end to the other - as well as countless numbers of beautiful maids. Taro was the grandson of Hokusai Hanaukyo, who amassed the Hanaukyo Family's fortune single-handedly. However, Hokusai was absent from the estate and, all of a sudden, Taro was handed the family's inheritance and ended up being the head of household for the Hanaukyo Family - a family so wealthy that it even has the power to divide the country of Japan. The maids Taro ends up living with are such characters as Mariel, the head of the maids; Konoe Tsurugi of the Security Department; Ikuyo Suzuki of the Technology Department; and Grace, the computer expert. 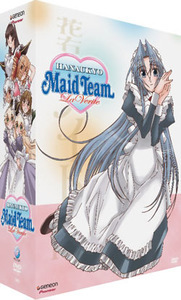 Each of those characters possesses a unique talent and they comprise a group of maids with different expertise called the "Hanaukyo Maid Team." Taro spends his days at the mercy of those maids' antics, whose top and only priority is to "serve the head of household, Master Taro!" Contains all 12 episodes in three volumes.